(Feb. 27, 2018) -- The University of Texas at San Antonio (UTSA) College of Public Policy and the League of Women Voters are partnering to host the Judicial Candidate Debate tonight from 6 p.m. – 7:30 p.m. in the Buena Vista Street Building Aula Canaria (BVB 1.328). Candidates vying to become the next Criminal District Court judge will discuss their positions and allow for questions from the audience. >>Watch a livestream of the debate on NOWCast SA. “The judicial elections are so important to how we live our everyday lives that we want voters to have as much information about the candidates as possible,” said Phyllis Ingram, director of voter services for the League of Women Voters. Free event parking will be available in unmarked spaces of lot D-3, beneath IH-35. The primary election is Tuesday, March 6. Early voting is going on now through March 2. The UTSA Main Campus is an early voting site. Registered voters will narrow down on party candidates who will represent each party in the November general election. Check voter registration status and see sample ballots. Learn more about the UTSA College of Public Policy. 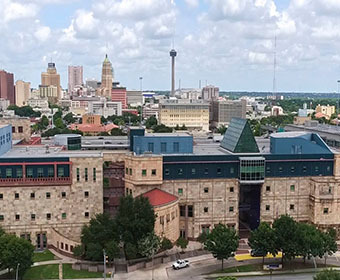 Connect with UTSA online at Facebook, Twitter, Vimeo, Instagram and LinkedIn.